Phnom Penh (FN), Nov. 7 – Cambodia and the United States trade in goods has reached $3.2 billion in the first nine months of 2019, up 39 per cent compared to the same period in 2017, according to the report on Cambodia-US Trade of Cambodian Commerce Ministry’s Statistics Department released on Wednesday. 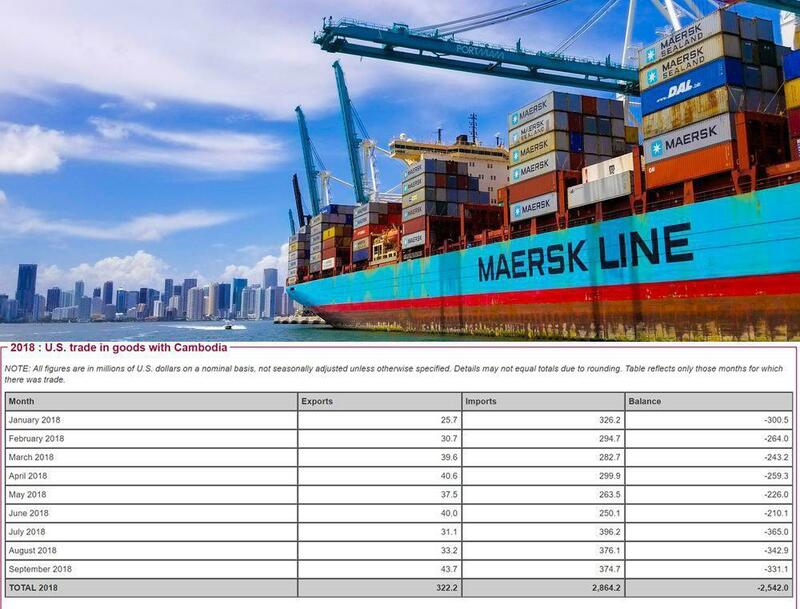 From January-September period, Cambodia's exports to the US, mainly apparel, amounted to US$2,864 million, an increase of 27 per cent, whereas imports, mainly vehicles, machinery, and medical equipment, reached US$322 million, increased by 12 per cent. The US remains Cambodia’s largest trading partner and export market. Cambodia is currently the 67th largest goods trading partner with US, according to Office of US’s Trade Representative, while Cambodia was the US’s 101st largest goods export market in 2017. Cambodia is a party to many regional free trade agreement agreements. These include the ASEAN Free Trade Area, and ASEAN agreements with Australia, New Zealand, India, Japan, China, and Korea. Cambodia also is participating in the 16-member Regional Comprehensive Economic Partnership negotiations.